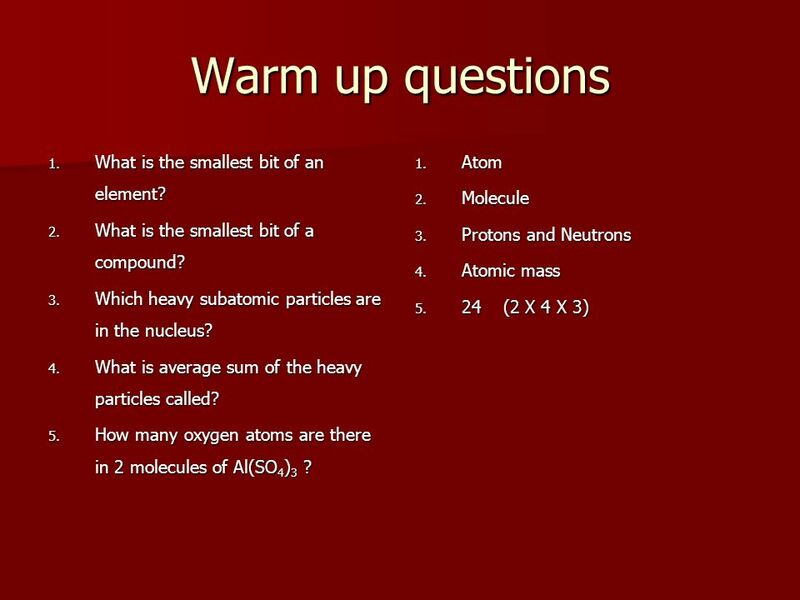 2 Warm up questions What is the smallest bit of an element? 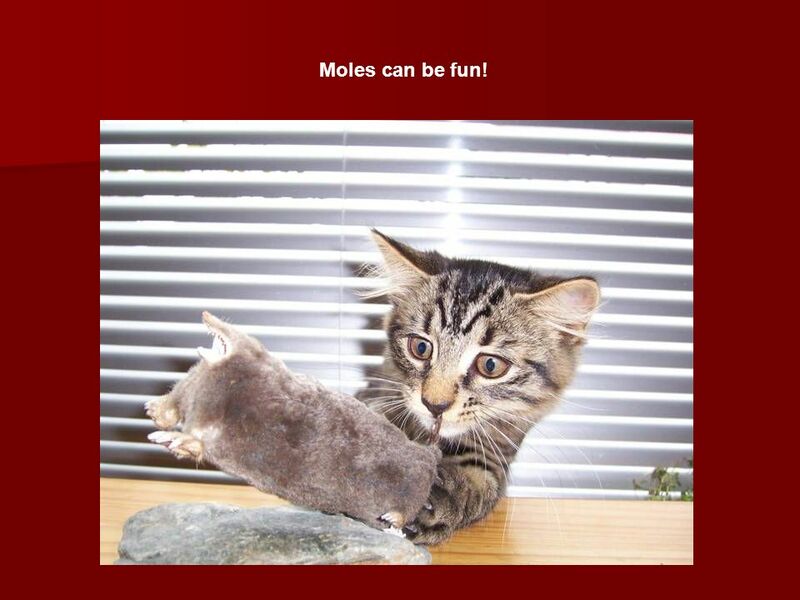 3 Moles can be fun! 4 Today you will learn: What a mole is. What a mole lets chemists do. 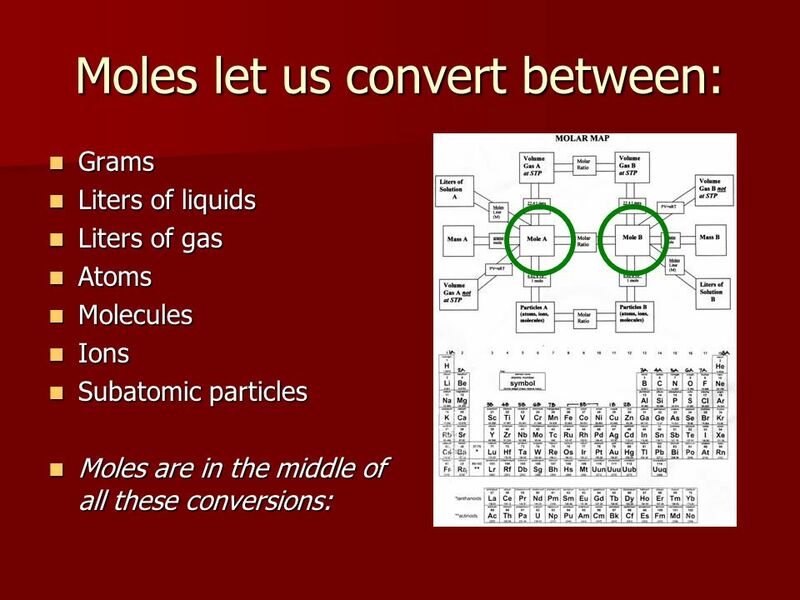 How to convert atoms and moles. How to convert moles and grams. What else moles can convert. 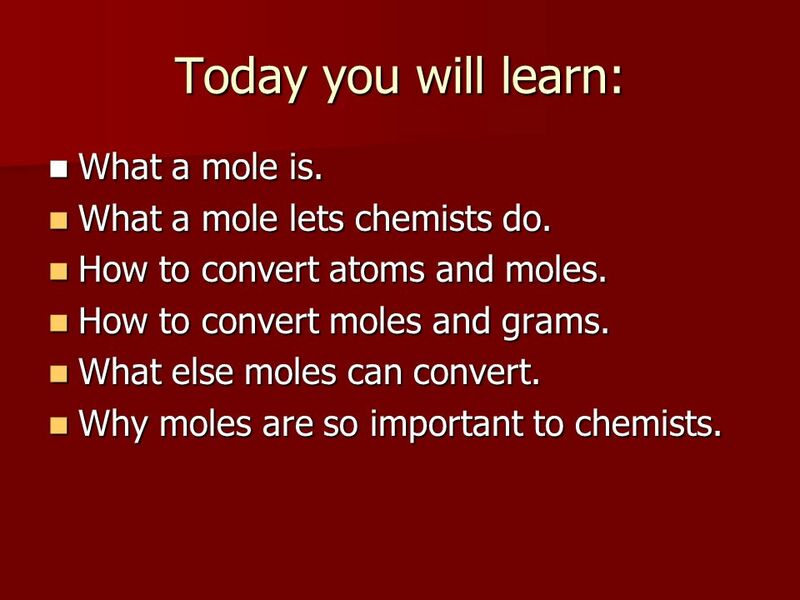 Why moles are so important to chemists. just like a dozen is a number. 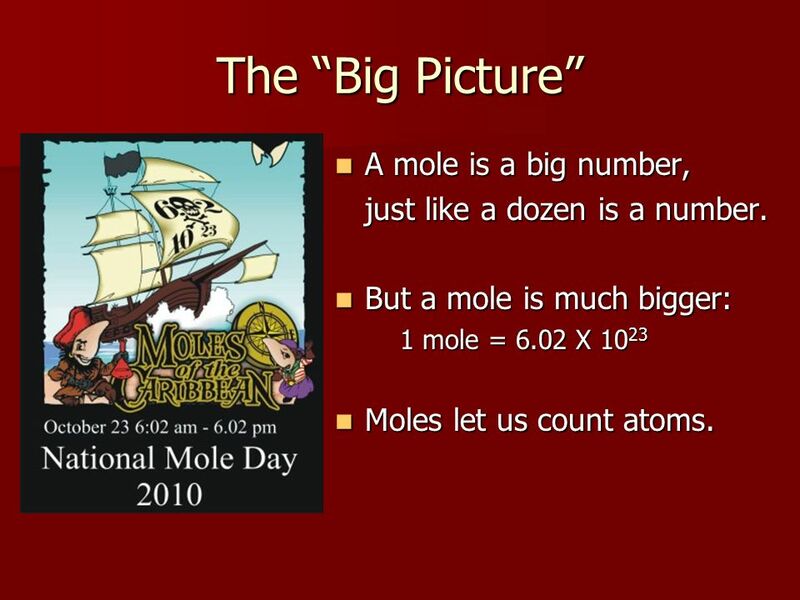 But a mole is much bigger: 1 mole = 6.02 X 1023 Moles let us count atoms. 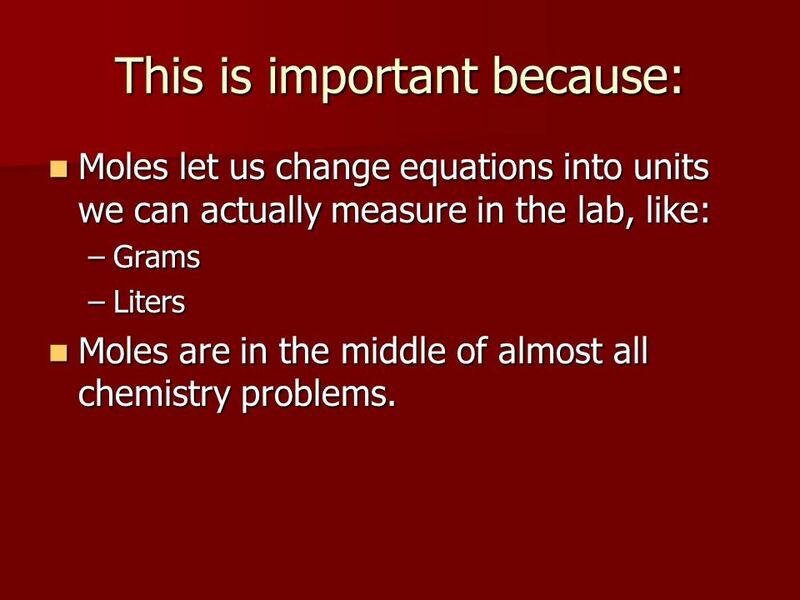 Moles let us change equations into units we can actually measure in the lab, like: Grams Liters Moles are in the middle of almost all chemistry problems. 602,000,000,000,000,000,000,000 This is sometimes called “Avogadro’s Number.” How big is that? a mole of pennies in one stack would reach up past the moon! to count up to one mole would take centuries. Moles let us count atoms. 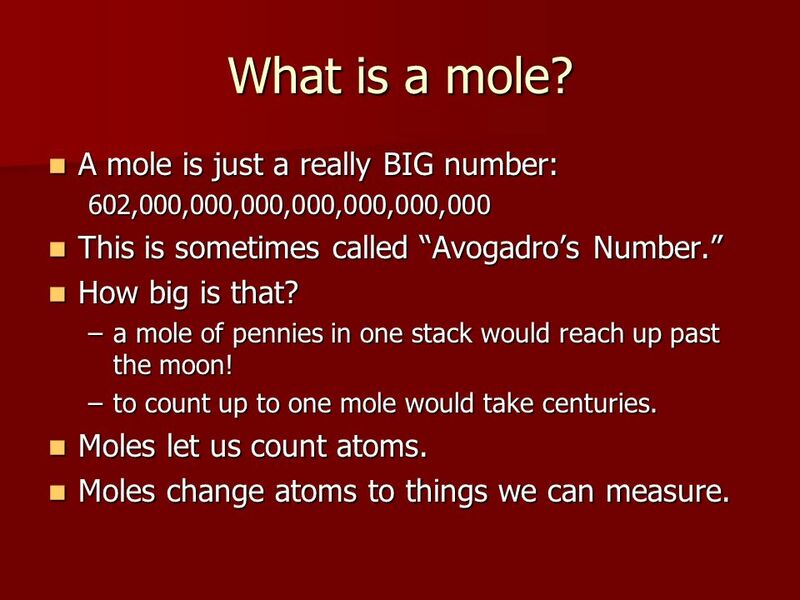 Moles change atoms to things we can measure. 9 Moles to Grams Atomic mass is the average number of protons and neutrons. It’s also the number of grams in one mole of atoms. To change from moles to grams, multiply by atomic mass. 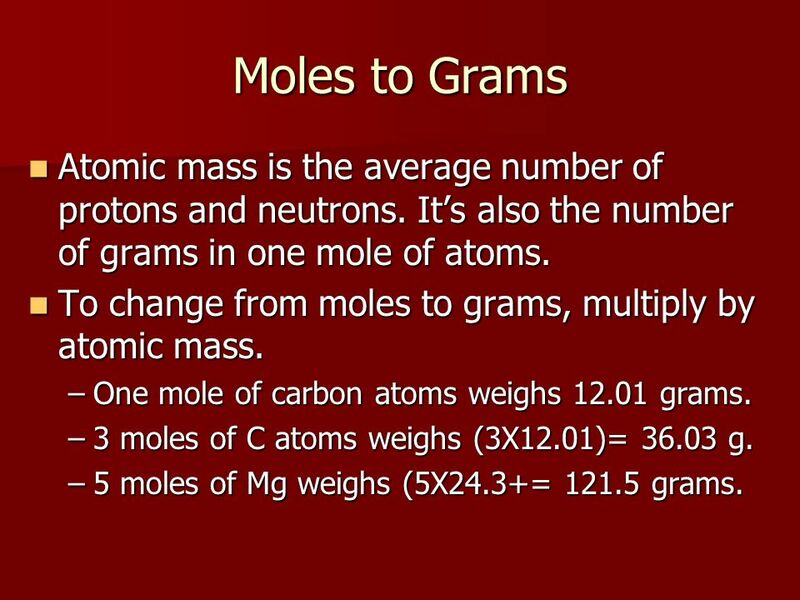 One mole of carbon atoms weighs grams. 3 moles of C atoms weighs (3X12.01)= g. 5 moles of Mg weighs (5X24.3+= grams. 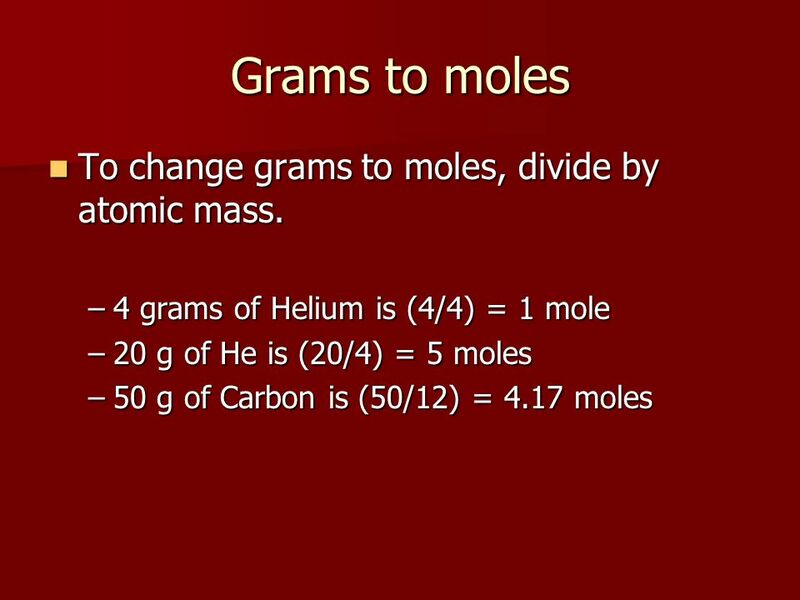 10 Grams to moles To change grams to moles, divide by atomic mass. One mole of any gas at standard temperature and pressure is 22.4 liters One mole equals 6.02 X1023 atoms, molecules or subatomic particles. 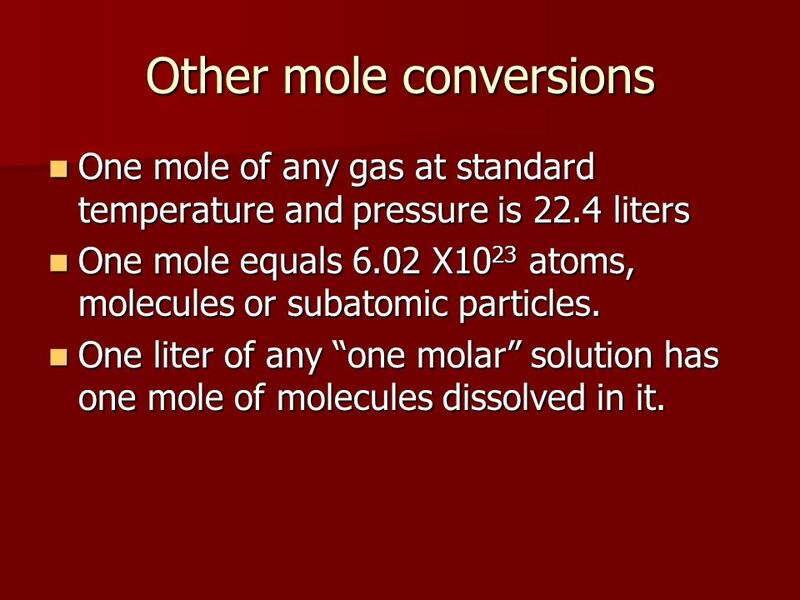 One liter of any “one molar” solution has one mole of molecules dissolved in it. 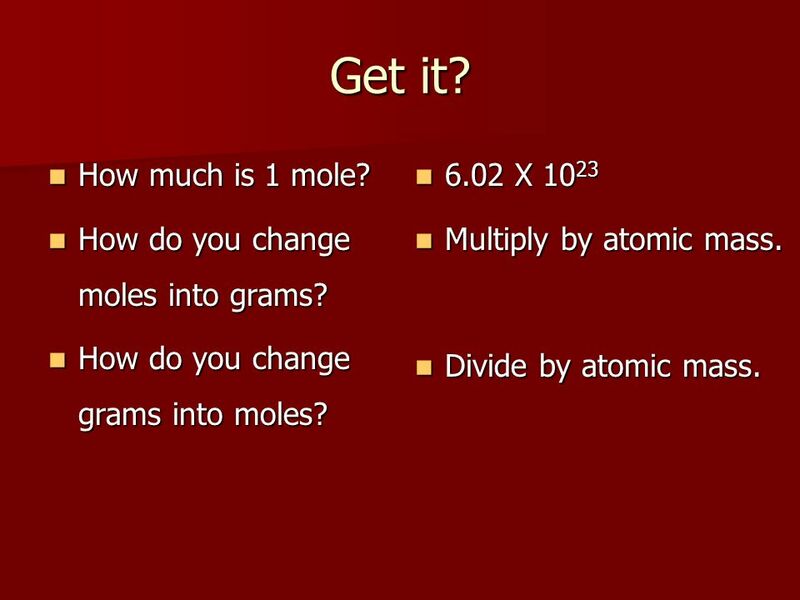 12 Why moles matter Moles let you change formulas and equations into units you can actually measure, like grams and liters. Moles let you “count atoms”, without actually counting them. 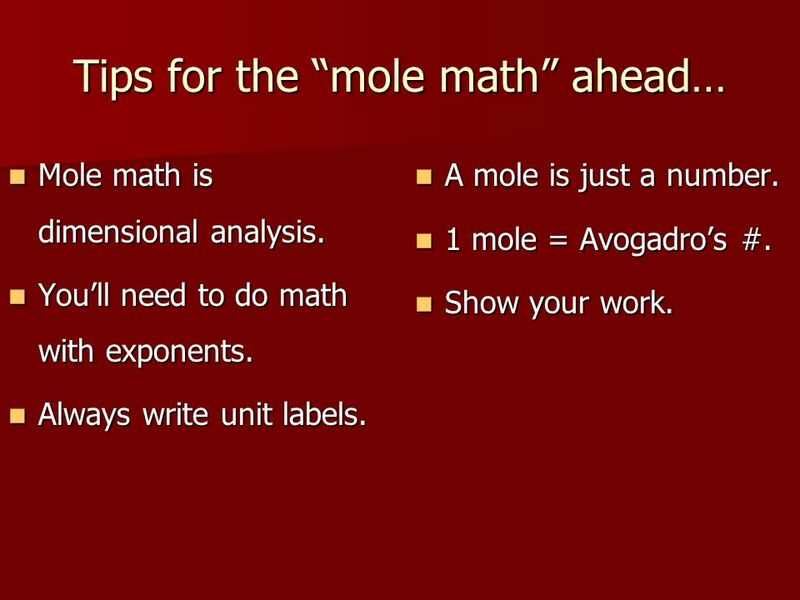 Mole math is dimensional analysis. You’ll need to do math with exponents. Always write unit labels. A mole is just a number. 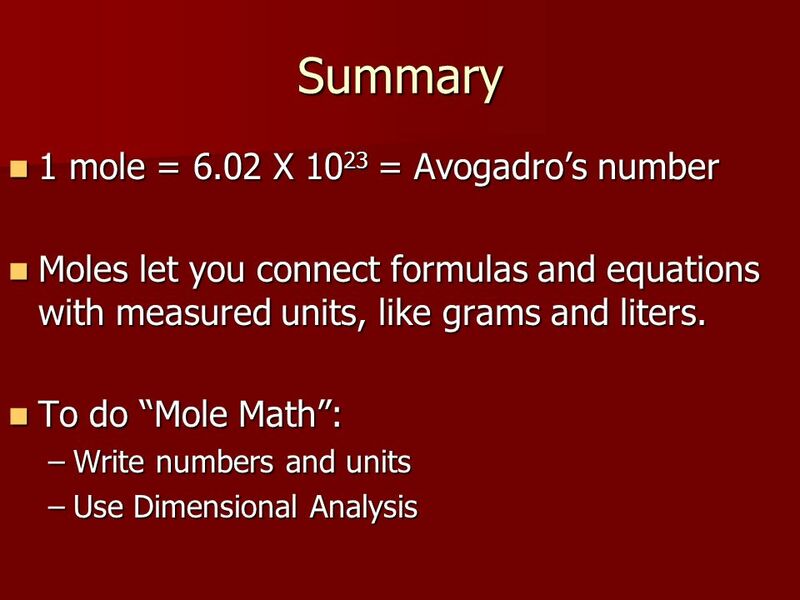 1 mole = Avogadro’s #. Show your work. 15 Get it? How much is 1 mole? How do you change moles into grams? How do you change grams into moles? 6.02 X 1023 Multiply by atomic mass. Divide by atomic mass. 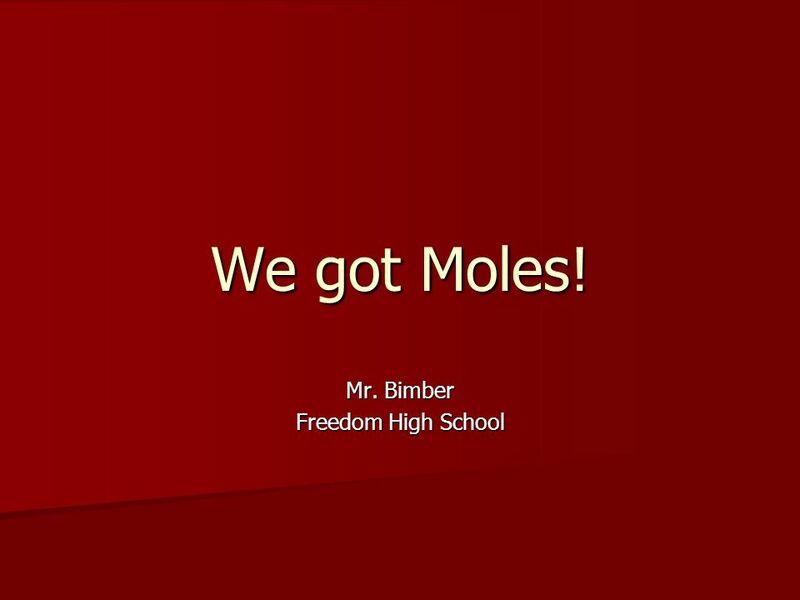 Download ppt "Mr. Bimber Freedom High School"
Moles Moles Atoms Moles Grams MOLES Copyright Sautter 2003. Unit 6 - Chapter 12 The Mole. 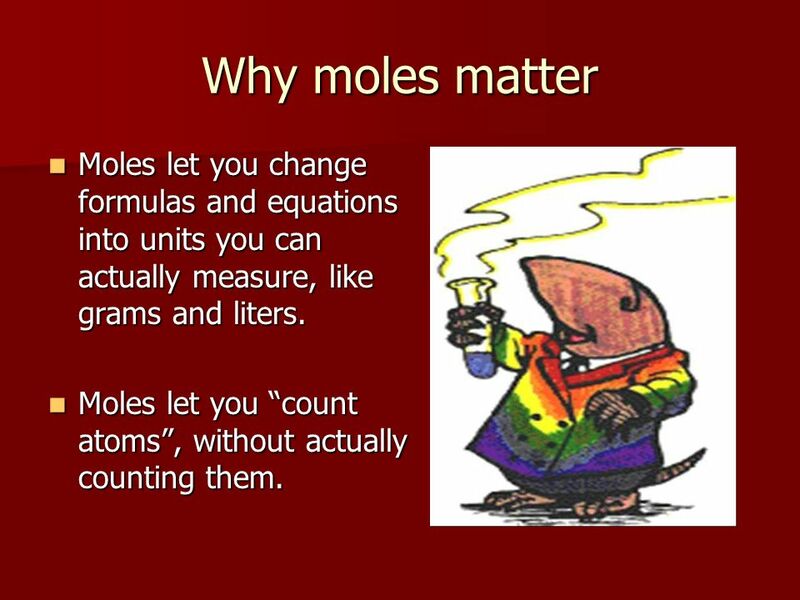 Chapter 6 Mathematics & Chemical Formulas Unit 7 – The Mole. Chapter 11 The Mole Section 11.1 Please have a highlighter and your periodic table out. Counting units such as dozen or gross are commonly used to deal with large quantities of items. No matter what we are counting, a dozen means 12, whether.